DefenseWall is the easiest way to protect yourself from malicious software (spyware, adware, keyloggers, rootkits, etc.) when you surf the Internet! Using next generation proactive protection technologies, sandboxing and virtualization, DefenseWall helps you achieve a maximum level of protection against malicious software, while not demanding any special knowledge or ongoing online signature updates. Try it today! DefenseWall HIPS 3.24 is a shareware program and can be used as a demo to try the software until the free trial period has ended. A full version of the program is available after the trial period ends. 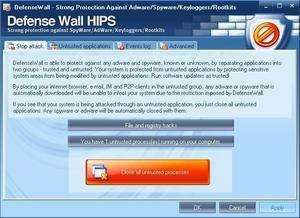 For security reasons, you should also check out the DefenseWall HIPS download at LO4D.com which includes virus and malware tests. Additional screenshots of this application download may be available, too.